Two communications giants. What makes them similar and different? AT&T as Ma Bell ruled the roost as the biggest communications company for over a 100 years. It had a plethora of technology inventions, 100 million subscribers, and over a million employees before its break-up in 1984. Today, Facebook has well over 2 billion monthly active users. Clearly, AT&T and Facebook differ in how they enable communications. Despite many differences, there are similarities between the former with roots in the 19th century and the 21st century infant. What are their similarities and differences? What are the lessons from AT&T for the 21st century behemoths in Information and Communication Technology (ICT) and Media industry? It is easy to be awed by AT&T’s telecommunications prowess alone and miss the true strength of AT&T. Over the course of the 20th century, AT&T’s influence went well beyond communications. STEM Breadth and Depth: AT&T’s technology expertise ranged from scientific research to applied technology, thanks to Bell Labs. Their assets spanned communications (core business) to computing, content, semiconductor, and basic sciences. Inventions like the transistor paved the way for ICs and modern computers; Unix and C paved the way for distributed systems and Internet. Barred from Computing: AT&T held a treasure trove of patents across communications and computing. The 1956 consent decree with the government prevented AT&T from entering the computer business while preserving its monopoly in telecom. Western Electric division built and sold communications equipment. Enters Computing and Leaves: Divestiture in 1984 – a seemingly clever idea then – split AT&T up, but gave it the rights to enter other markets including computers. Heralded as an unshackling of the giant by some, the market expansions for the information age failed to materialize. Their hostile takeover and renaming of NCR to AT&T Global Information Services lasted 4 years, only to be spun out. Against that backdrop, let’s see how AT&T and Facebook compares across the three dimensions of communications, computing, and content. AT&T had over 100 million subscribers in a world without cellular wireless communications and low tele-density. In a world with high wireless penetration, Facebook community has over 2 billion monthly active users (MAU). Its assets WhatsApp and Facebook Messenger has over 1 billion MAUs each (Note: These users overlap across the services and hence can’t be summed up). It was simple to count AT&T’s subscribers based on lines in use. Now we count usage, not simply registered users. Underlying connectivity technologies and tele-density in their eras make direct comparison of the numbers alone meaningless. Hence, these numbers simply illustrate the magnitude and impact of each in their epoch. Facebook’s Telecom Infrastructure Project (TIP) aims to drive new approaches to telecom network implementation in a world of wireless connectivity, 5G, and IoT. Aquila is a solar-powered drone initiative that beams connectivity. These are just two of the initiatives aimed at global connectivity. AT&T desired to monetize its computing and information services business, but prevented by regulation from 1956 to 1984. It had the technologies like transistors, Unix, C etc. that eventually propelled the drive to the Internet. For Facebook, computing and telecom network are simply enablers, not direct money-makers. Unlike its contemporary mega peers (Microsoft, Amazon, Google), Facebook is not offering a computing service. It is focused on lowering the costs to build and operate compute and network infrastructure. Facebook exerts considerable influence in cloud computing architectures via the Open Compute project (OCP). TIP is for communications what OCP is for computing. OCP and internal efforts like FBAR (Facebook Automated Remediation) to automate data center operations drive profits by keeping opex low and service availability high. In AT&T’s prime, analog broadcast TV was the norm. Media and telecom weren’t converged as we know it today. Most Bell Labs’ innovations were enablers for content creation and distribution. Facebook has just started to offer digital content through its Watch platform, moving it from offering user-generated content alone to professional, branded media. 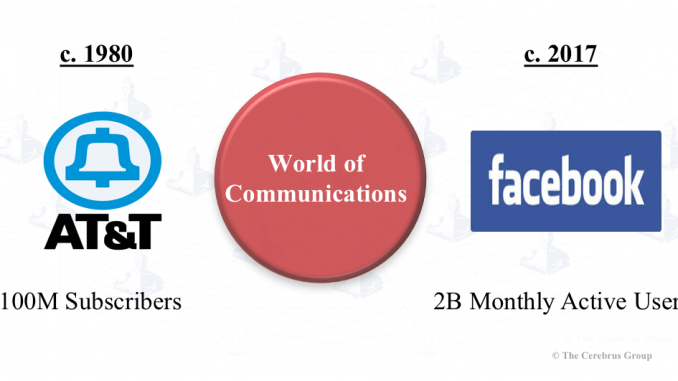 A comparison of Facebook with the AT&T reincarnation, “at&t”, and its pending acquisition of Time Warner is below, juxtaposed on top of the communications assets used to deliver them. AT&T buys Time Warner just to keep up with the Joneses (e.g. Comcast and NBC, Verizon and Yahoo)? Unlikely. The new AT&T may be preparing for a larger battle looming in the Telecom, Media, and Entertainment world. AT&T and Facebook: Apples and Oranges? What makes AT&T dissimilar from Facebook? 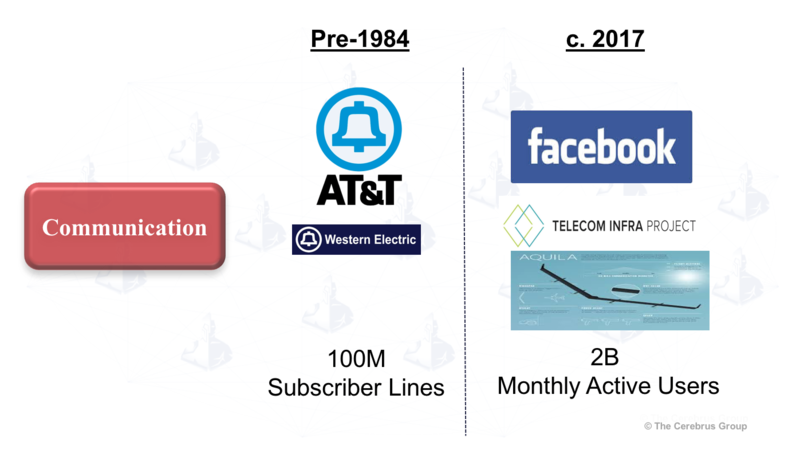 Monetization: AT&T and Facebook are both communications service providers. The main difference is that AT&T monetized the communication services directly while Facebook monetizes them indirectly via advertisements. Innovation: AT&T brought inventions to market. Phone being the prime example. Facebook on the other hand is (so far) applying technology for the outcomes of social connectivity. This is also a reflection of their times. Vertical Integration: From Bell Labs to Western Electric, AT&T was vertically integrated from pure research to businesses. Facebook’s vertical integration from communications to networking and computing is via TIP and OCP. Their content to communications integration is just starting. Competition: Formidable competitors stand between Facebook and the next 100 years. AT&T dealt with a different competitive and regulatory environment. The historical and current picture of their vast swathes of business is below. Given the similarities at the communication solution level, is Facebook really a second-coming of AT&T? Is it a progression from Grand Dame to Lady Belle? Facebook’s ability and ambition to connect a planet of people and businesses in myriad forms and using that to propel it to create revenue streams is impressive. Despite the relative infancy of Facebook, their impact in the world of human communications is significant in driving social and business changes. Still, dominance in the 21st century will be different from what it was in the AT&T age. Whether Facebook will have the multi-generational, multi-century impact that Ma Bellhad on the world of communications, computing, and semiconductors is early to tell. People who know Bell Labs innovations and their profound impact in our daily lives may dismiss this notion right away. This comparison seeks to understand and inform future strategies of these two and other large players in technology, telecom, media, and entertainment. What do you think? Is the comparison apt? Does it do justice to each firm? Take a look here on how Ma Bell, Big Blue, and the Big 5, F-M-A-G-A(Facebook-Microsoft-Apple-Google-Amazon), of media and information technology stack up against each other.